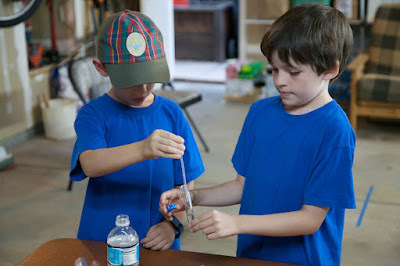 Last week, Trevor's Cub Scout den finished up their "Adventures in Science" activity pin. I've already shared what we did for the first meeting, so I recommend reading that first if you haven't already. 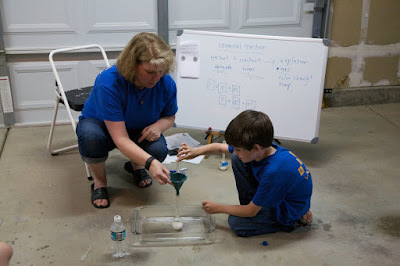 Meeting #2 was in our garage Cub Scout Science Lab. We did a bunch of experiments with different household items like baking soda, vinegar, and dish soap to observe chemical reactions. The boys used scientific equipment, including pipettes and test tubes. We tested different reactants with litmus paper, made predictions, conducted the experiments and made observations. 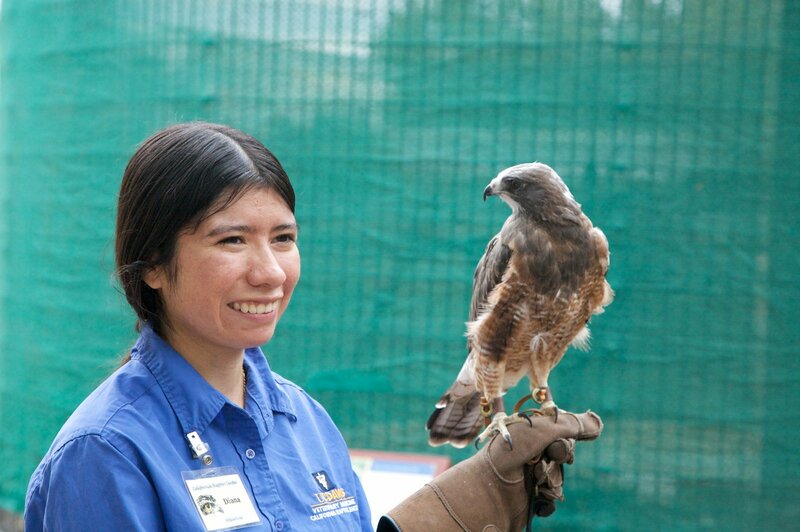 Meeting #3 was a field trip to the California Raptor Center on the University of California, Davis campus. Each Scout had prepared questions to ask the scientists and volunteers that work at the Raptor Center. If you are local to the area, I strongly recommend a visit, particularly during one of their open houses. We toured the facility, watched an excellent presentation, then visited the museum. This is what Trevor would look like if his eyes were as large as an owl's eyes are in proportion to the rest of the face. Meeting #4 took place in the Cub Scout Science Lab and in our kitchen. I split the boys into two groups. While Steve stayed in the Science Lab showing one group how to make series and parallel circuits, I did some food science with the other group. We talked about how oil and water don't mix, then connected that to how cream rises to the top of milk. Each Scout shook a container of cream, stopping when it was thick to taste the whipped cream they made. They returned the lids to their containers and continued shaking until the liquid separated out and they were left with butter. 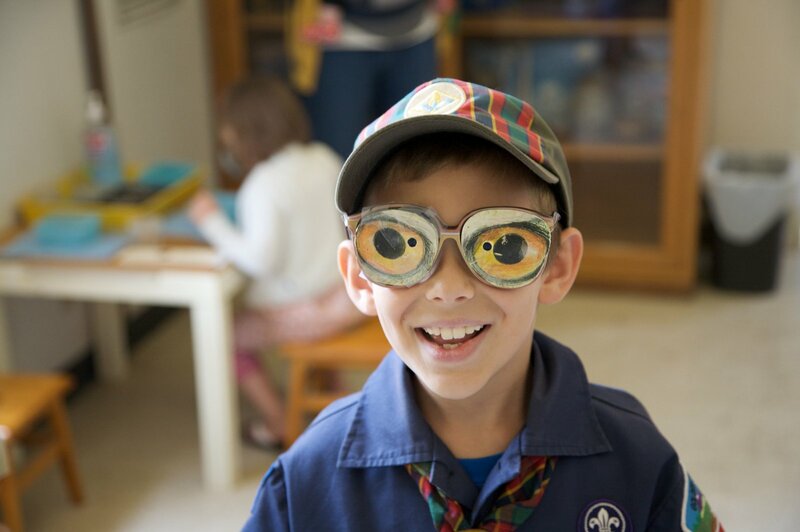 The Scouts gave their homemade butter a big thumbs-up. After we finished up the stations, we went back to the Science Lab to have a building competition. 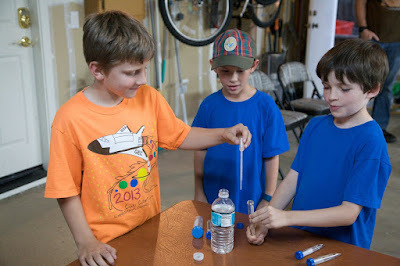 Each Scout had one piece of newspaper, 200 stickers, and 15 minutes to design the highest free-standing tower he could. ... but literally one second after I called time, it fell over. Steve measured each remaining tower and declared the winner to be the one that was 26" tall. I had such a fun time leading the science adventure. Congrats to the boys for all the hard work they did to earn this activity pin! How fun! 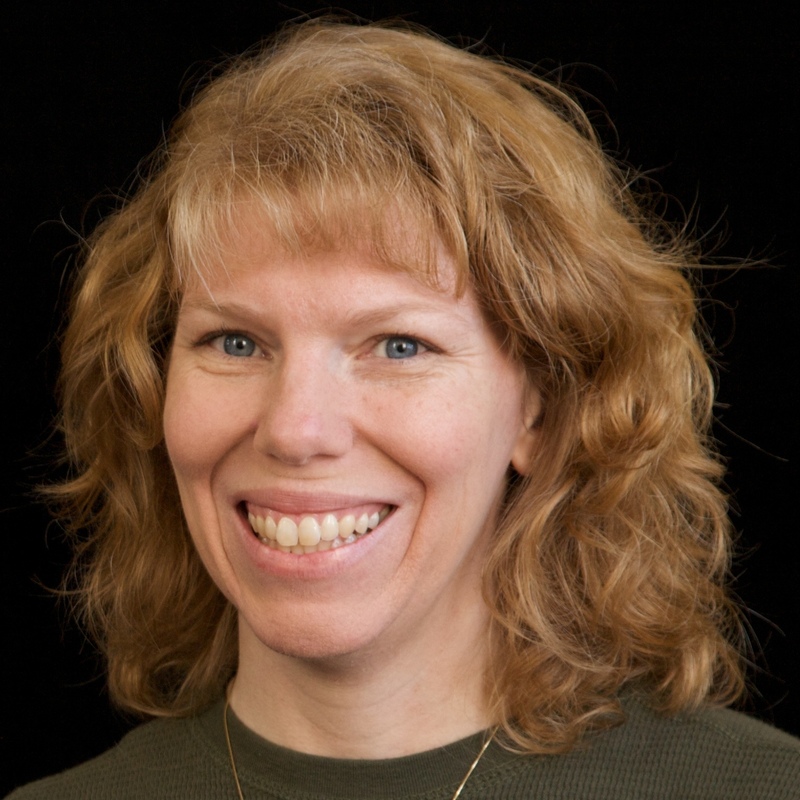 LOVING all the photos!!!!!!!!!!!!!!!!!!! !